One doesn’t go to Mandarin Deli for the ambiance. One goes for the simple, comforting, food. Just be warned, the place is small and serves stinky tofu. If you’re unlucky, you might be stuck sitting next to a table that ordered a plate. 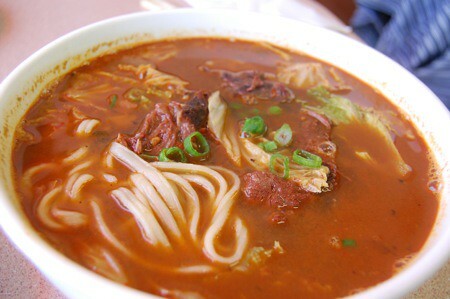 I had the mala (spicy) beef noodle soup. The broth was every bit as spicy as it looked. There wasn’t much numbness despite it being called mala in the broth, but there was definitely spiciness. It’s been a while since I had this dish, but the pieces of beef in here tasted a lot like corned beef. I don’t remember if this is normal or not. The noodles were satisfyingly chewy and the broth was flavorful. I just wish I wasn’t such a wuss so I could have finished the whole bowl, but by the time I was a quarter through it, I was already sweating bullets. This dish is not for the faint of tongue. The BF had the dan dan mien which is cold noodles with a slightly spicy peanut sauce. Unfortunately, we forgot to ask them to make it vegetarian, so there was some ground meat in it. The observant lady working in the restaurant that day told us that next time to we should remind her to make it vegan so she can leave out the meat. She said she felt bad that the BF couldn’t finish it, which made me feel at home there. I always feel bad when I leave leftovers on the plate. It was something only someone who cared about their food would say. We also ordered the stinky tofu which was pungent smelling, but not pungent tasting. 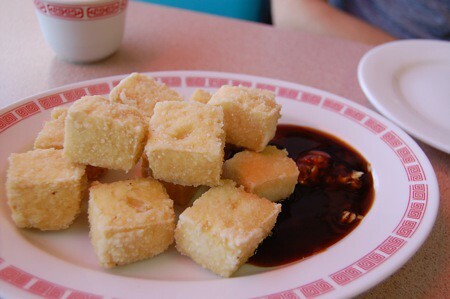 I’m still looking for a place that has stinky tofu as flavorful as the ones I had in Shanghai, but I doubt I’ll be able to find it here in LA thanks to health regulations. Despite that, I still enjoyed the stinky tofu at Mandarin Deli. It was freshly fried, had a crispy exterior, and came with that deliciously thick and garlicky dipping sauce. I just wish the inside was more flavorful. I wouldn’t call Mandarin Deli a destination spot, but it’s a good place to have a simple lunch at when you’re in the neighborhood and you’re craving Chinese food. The craving for some chewy handmade noodles drove us to this new place in Monterey Park: Kam Hong Garden. Just driving by, it looks a little too clean and sterile for the SGV, but the food was surprisingly good and the staff are friendly and accommodating to vegan/vegetarian patrons. 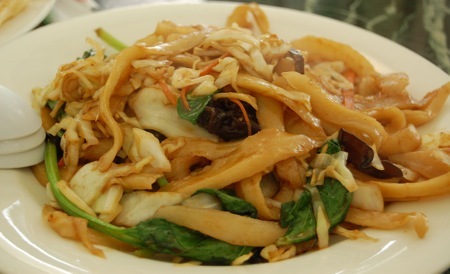 The vegetable stir fried hand-cut noodles (vegan) looked good and had a nice wok-chi flavor. The BF thought it wasn’t hearty enough and there was too much cabbage, but I thought it tasted fine. 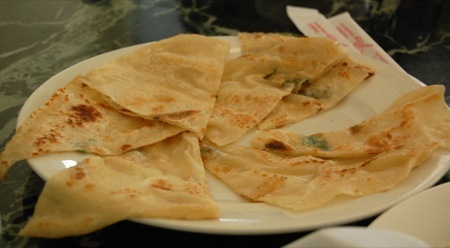 We also ordered some spring-onion pancakes (vegan). They were tasty, but nothing special. They lost their crunch pretty quickly, unfortunately. This is my favorite dish from Kam Hong Garden so far and it deserves the number one spot on the menu. I don’t know what it’s called in English, so I’ll just call it “House Special Noodle Soup”. In Chinese, I order it as san shi dao xiao mien. 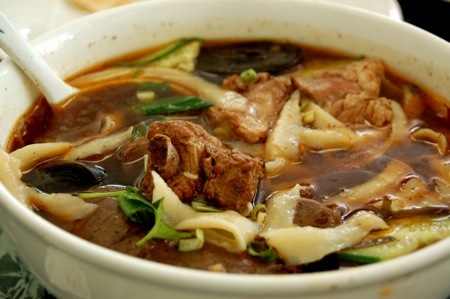 It’s beef noodle soup with a deep beefy broth, curled slices of kombu, slices of cucumber, and hand-shaved noodles. It tastes especially good after a splash of the black vinegar. For those who don’t want to brave having hot broth on a scorcing summer day, there’s always jia-jian mien (vegan). I don’t think the usual version is vegan, but if you specify it to the waiter, he can make it vegan for you. 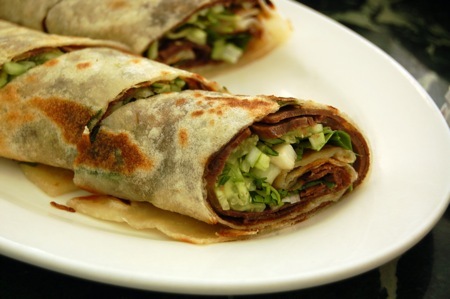 The beef wraps were also surprisingly good. For a place that specializes in noodles, I didn’t expect this to taste so good, but people seemed to like it. I love the sweet paste they have inside and I don’t even mind the cilantro even though I usually hate it. Very refreshing on a hot day. Maybe it was a mistake to order this, but the xiao long baos were only okay. 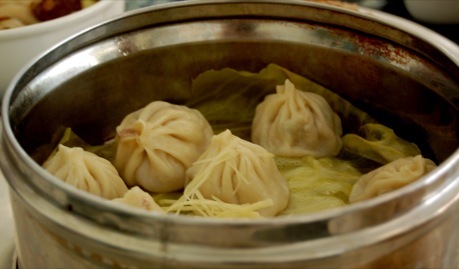 They’re hand-made and sometimes you can see Mama Yang behind the glass stuffing them, but they don’t compare to the xlbs at other places. I thought the filling was a bit too hard and salty, but the wrapping was nice and chewy. 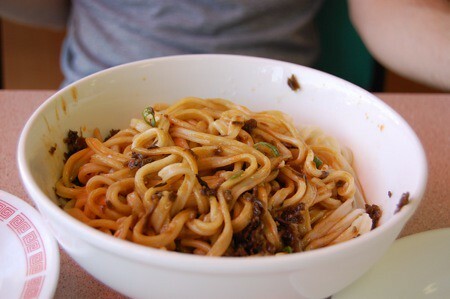 Kam Hong Garden is a great choice if you’re craving hand made noodles. 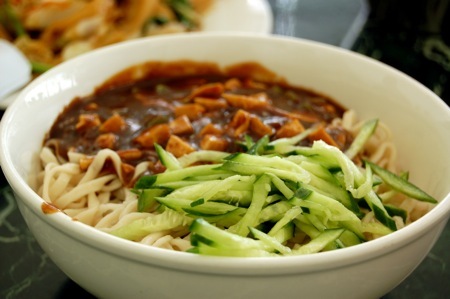 For most of the noodle dishes, you can specify if you want hand-shaved noodles (the long, flat wavy lasagna-like kind), hand-pulled (long, thin and irregular), or even nien gao (rice ovalettes). I’m a big fan of hand-shaven noodles in soup because they’re so chewy and satisfying, so I would definitely suggest ordering any type of hand-shaved noodles in soup.